Creamy and delicious avocado slices are all the condiment you need to make this cheesy roasted turkey breast sandwich. SLICE the avocado. I use my OXO Avocado Slicer to do all of the dirty work. 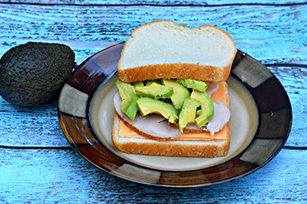 LAYER the KRAFT SINGLES cheese slices on one slice of bread, then your OSCAR MAYER CARVING BOARD Oven Roasted Turkey Breast, last but not least your avocado slices. PLACE other bread slice on top.